Thirteen-year-old Zaid and his friends, siblings Fatima and Salman, leave innocence behind when their parents send them away at rumors of rebel attacks. The teenagers discover that nowhere is safe, as they are besieged repeatedly by rebels, and learn that the military cannot be trusted—they are alone. Strangers sacrifice their lives; strangers betray them; strangers ask for help…evoking survival instincts and humanity’s courage in the darkest hours. They are children, separated from their parents, who must fear multiple, murderous factions and their own government, kids who days ago were living normal teenage lives, as any teenager in any country. 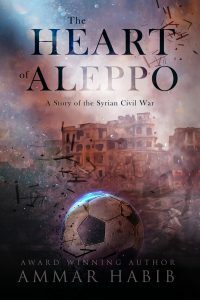 Habib’s portrayal of Syrian teens on the run from death, as well as their daily lives before the war, was supplemented by his friendships with native Syrians and interviews with Syrian refugees for accuracy. His hope is to bring more awareness to the world of a civil war that has killed hundreds of thousands of civilians who desire only the freedom he enjoys.